PRODUCTION ZONE: our vineyards located in Raderti Franciacorta. VINE AND VINIFICATION: The Franciacona D.O.C.G. Rosé Brut comes selections of Chardonnay and Pinot Noir. It owes its delicate color of the skins to a constant maturity "submerged cap." Fermentation takes place in stainless steel tanks at controlled temperature-or 9 °) with indigenous yeast in order to maintain the flavors and aromas of Franciacorta. During the months of March and April made the move in bottles for secondary fermentation. The bottles are stored in rooms of aging at controlled temperatures (12 - W) for at least 36 months. After this period, the Franciacorta D.O.C.G. Rosé Brut assumed its characteristic flavor and aroma, with perlage. We then move to the final stage of remuage degorgement and clothing for shipment. ORGANOLEPTIC CHARACTERISTICS: Pink onion skin choirs white foam, fine and persistent perlage. Scent of flowers (wild rose) and small (Erect red berry (raspberry). Delicate and complex flavor. Dry. Dry and gentle. Yellow with light golden highlights. Very fine and persistent perlage. An intense bouquet with a mixture of peach, honey and hazelnuts. The colour is yellow with refrelections of green. The perlage is fine and persistent. 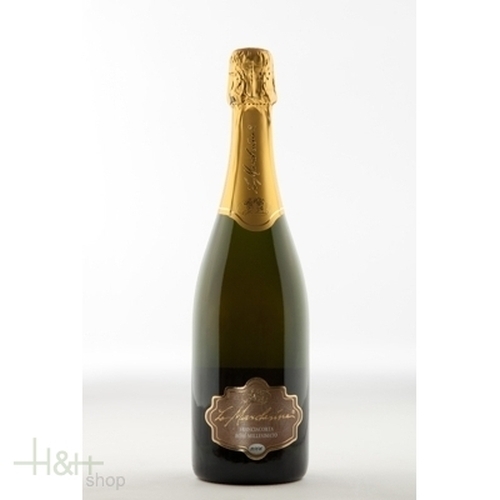 The bouquet is distinctive and compact, followed by a dry taste and finish abundant in elegance and full flavours.